Bushnell 854144 Legend Ultra HD 4.5-14x44 Multi-X Riflescope 854144 FREE SHIPPING! Appropriately named, revolutionary technology has come to life with Bushnell's Legend Ultra HD Riflescope. ED Prime glass and fully multi-coated optics ensures you have the clearest HD view possible. Unparalleled in every way, the Legend features a dry-Nitrogen filled optics chamber. The rugged, one-piece tube design and patented, permanent RainGuard® HD lens means dependability in extreme outdoor environments. Unlike lower end scopes, the integrity of its internal assembly is second to none. Waterproof, shockproof, fog proof, rock solid reliability is exactly what one should expect from this best-in-class hardware. Backed by Bushnell's bulletproof guarantee, this scope brings you the same great performance seen in their wildly successful Legend® Ultra HD binoculars. Unmatched versatility in range is offered through its variable power, quickly focusing from up close action or targets at long range. With fingertip windage and elevation adjustments, and a Euro-style fast focus eyepiece, whether it's big game or small varmints, you'll be ready for a strong, clear shot. 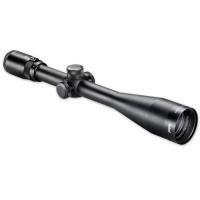 ©2002-2019 CopsPlus.com: Bushnell 854144 Legend Ultra HD 4.5-14x44 Multi-X Riflescope 854144 FREE SHIPPING!